The wilderness has its own perfection. Most people appreciate the untidy beauty of sticks, logs and fallen trees in their natural habitats. But it is a rare person who can look at a log or burl in its raw state and discern, beneath the dirt, bark and fungus, the magnificent artifact this hunk of wood could become. It is even rarer to have the patience and skill to coax the piece into its full, shining potential. This second article on woodworking explores the craftsmanship of people who take small, dull chunks of wood and make them into utensils, boxes, vessels and sculptures that feel good in the hand, please the eye and even stir the soul. Today's woodworkers have access to a great variety of materials, from richly figured maples to exotic hardwoods -- many of them the waste products of industries that use only the large, defect-free pieces. 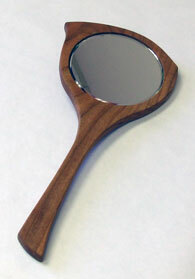 Cooking utensils are carved from curly maple, the barrels of pens turned from cocobolo. Butcher block cutting boards incorporate black walnut and purpleheart. Vermont Artisan Designs features a delightful array of useful items made by local artisans from both native and exotic woods -- natural cherrywood spice spoons, brightly lacquered salad bowls and richly patterned parquet-style cutting boards. 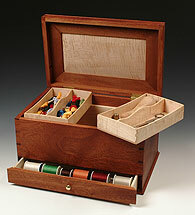 Beyond these lovely basic tools, Vermont Artisan Designs offers a number of finely crafted boxes. 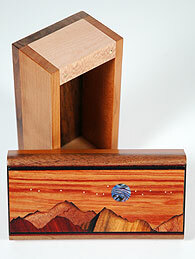 Inlaid jewelry cases by Bob Tool, designed for keeping small treasures, are treasures in themselves. T. Breeze Verdant's exquisite marquetry -- a superb kind of collage that requires intense focus and precision -- also graces the shelves. Using veneers, shells and metals, Verdant decorates his boxes with images from the natural world. He incorporates a stunning spectrum of colors and grains, cutting tiny pieces of tissue-paper-thin veneer to represent every detail, from supple magnolia petals to gently curled blades of grass to lacy dragonfly wings. The artisans represented by Rueter Woodworking specialize in fine furniture, but this relatively new studio and gallery features some table-top pieces as well, including salt and pepper shakers by Philip Odegard, hand mirrors by Bob Rueter and turned bowls by Lee Bruder. Custom cabinetmaker Jason Breen has made smaller, more intricate pieces, including a custom reproduction of Thomas Jefferson's lap desk, for which he had to make the chisel and the bevel square. Breen likes both large-scale and detail work, and enjoys switching between timber frames and tiny dovetails. "The tolerances are so different," he said. "If I only did small pieces, I would go crazy, and when I'm working with timbers, I miss doing the fine work." While contemporary standards have freed woodworkers of all kinds to let the gorgeous grains, figures and knots show through in their work, the constraints of utility do limit what materials can be used. Sculptors, however, can use any root or burl they fancy, and they specialize in letting a piece of wood become whatever it wants to be. This should not be confused with leaving the wood as it is. Drawing out the piece's inner character requires hours -- sometimes months -- of patient, precise work. "You start with your material and try to reveal what's in it, honoring the natural shape and adding your own two cents," says Michelle Holzapfel. She and her husband, David, started their Applewoods studio thirty years ago in Marlboro. Michelle turns and carves vessels, while David makes sculpted furniture. The two enjoy a "symbiotic relationship" with the logging industry, which allows them to make their art from local, cast-off wood. 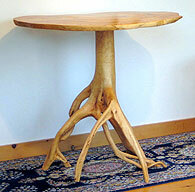 One of David's classic designs features a round tabletop mounted on a meticulously polished tree hollow; another involves a burl cross-section tabletop on a pedestal of sculpted, asymmetrical root forms. 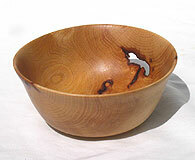 Michelle's astounding carvings begin with intriguingly cracked, distorted or spalted logs or burls. She considers the shapes and colors that characterize the piece before she begins her work, stippling to bring out darker shades, smoothing to bring out lighter ones. While she ostensibly makes vessels, function cedes utterly to form; these are sculptures. Her joyful carvings of people and beasts are distinctively comedic -- so sure of their rootedness in the earth that they don't bother taking themselves too seriously. Sculptures by Deborah Bump have a similar comedic attitude, but a vastly different style. 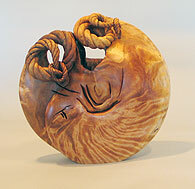 Far from doing elaborate carvings, Bump removes as little wood as possible from a piece to manifest the animal inside. She does not carve faces or even eyes, instead allowing the grain, like the lines of a topographic map, to suggest the features and markings of gorgeously streamlined birds and fish. Bump uses unusual (though not rare) woods, like pistachio, mesquite and locust. These extremely hard and gnarly specimens arrive in her studio with a great deal of personality, and then, under Bump's skillful hand, they yield their animal essences: the serpentine twist of the anhinga's neck, the sleek curve of the diving goose, the pert tail of the wren. Like Bump, Gregory Stone is inspired by nature -- and particularly birds -- but with utterly different materials and results. His detailed river-wood collages have an effortless look about them that belies their intricate structure. Stone must do a good deal of carving to fit pieces together so that they look natural. After being carved to fit, pieces are joined together with pegs; Stone even uses toothpicks in the smallest sculptures. While he has often modeled his birds on pictures from books, he feels his best work comes through direct study. After a great blue heron began nesting outside his studio, Stone reported, "I thought I was doing herons really well until I had watched that one for about an hour." Sculptor Donald Brehm responds to his woods in another way, working the pieces with a light hand so that they retain much of their original shape as abstract sculptures (see cover and Vermont Artisan ad on page 2 for samples). Brehm carves a little, to facet the pieces on multiple planes, and adds his own bits as well. Pieces of steel achieve an "interplay" between the porous wood and the impermeable metal, and some touches of green lacquer on the metal and in the wood's fissures suggest oxidization. The mixture of wood and metal toys with the viewer's sense of the material, calling to mind the real interplay between vegetable and mineral that underlies the cycle of life and death. 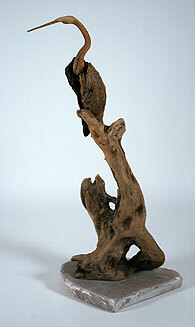 Like many wood sculptors, Brehm collects his pieces from the forest himself. "I have a connection right back to the spirit of the tree and the woods," he said. And it shows. Of course, having a connection to the wood does not necessarily require that you choose inherently funky pieces and then let them run around town in the buff. Many carvers use the once-living medium to create convincing representations of living things, then finish their pieces with paint or dye. Gallery in the Woods features a number of artists from around the world who do work inspired by traditional folk styles. 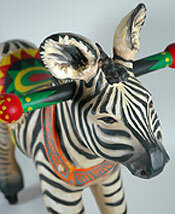 Smooth and lavishly painted "dream animals" are a unique product of Oaxacan carving families. American Traders, specializing in hand-crafted wooden canoes, shows a variety of wooden items in its West Brattleboro store and showroom. Offerings include gorgeously carved and painted duck decoys and fish. 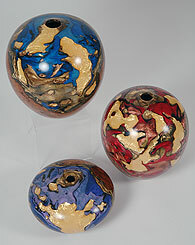 Bob Chatelain, who shows work in Gallery 2 at Vermont Artisan Designs, has invented a process called "hybrid turning," which begins with a burl and ends with a resplendent vessel whose surface resembles a planet viewed from space. Chatelain inlays the voids in the burl with a thick paste of pigmented resin, adding mica, metals and a layer of gold leaf over a several-day period. The piece is finished with a smooth layer of clear resin, which becomes a window through which to gaze at the swirls of color in the wooden vessel's craters. Carol Loeb, a lover of animals and a former scenic artist, carves and paints dynamic sculptures reminiscent of carousel horses. Each beast in her menagerie wears trappings inspired by the folk art of the native people in the animal's native habitat. When asked if they are toys or sculptures, Loeb said they are built to be used: the cheetah rocks, the zebra has wheels. "I've thought about doing pure sculpture," she said, "and I can't. ... It has to do something." Loeb started carving usable sculptures instead of painting because she can feel the animals coming into being as she makes them, and she wants them to remain alive, rather than becoming "clutter," for those who adopt them. Wood is probably the most versatile natural material on earth, and people do an amazing variety of things with it. But all seem to have certain things in common: deep reverence for their medium and a feeling that through their art the wood comes to life again. The wilderness does have its own perfection, but no single tree can go on forever. Except through the work of an artist.